A recent breakthrough in miniaturized sensor technology could end up taking a bite out of personal privacy. 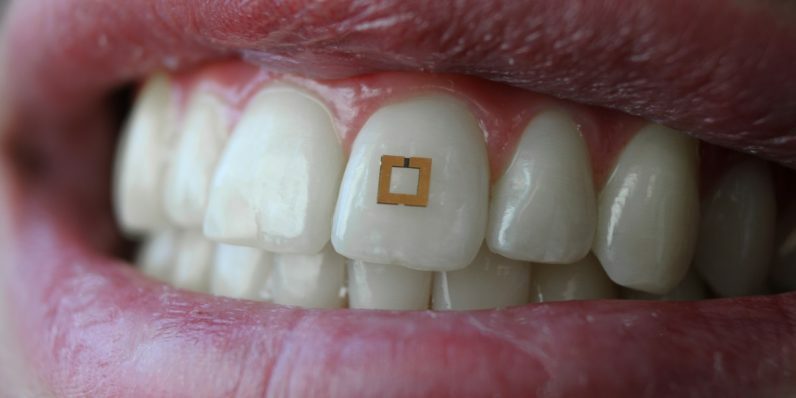 Researchers developed a wearable small enough to stick on a human tooth virtually unnoticed. And it’s capable of wirelessly transmitting data on any chemicals it comes in contact with. The team, researchers from Tufts University School of Engineering, set out to create a better solution for monitoring dietary intake. Their work could prove invaluable to medical researchers and has the potential to save innumerable lives. What if a tiny sensor that you didn’t even notice could send signals to your vehicle telling it not to start because you’ve had a few drinks? That might be a good thing, but the line between safety and privacy only gets blurrier from there. According to the researchers, this thing could be configured to detect just about anything. You’d probably notice if someone put a shiny square on your front tooth while you were sleeping (unless you never smile), but you may not notice one behind your ear or affixed to your scalp right away. And if that bothers you, perhaps you should avoid considering the “any other surface” bit, because without some sort of James Bond spy equipment or advanced training you’d have almost no chance of noticing a dozen of these stuck behind your walls, inside your toilet, or under the bumper of your car. Make no mistake, this is important research that will almost certainly save lives – but, once this technology is out in the wild, it’s pretty likely to be another tool for gathering our personal data. It’s not up to the researchers to ensure bad actors don’t missaporopriate their work, it’s up to our regulators and lawmakers to ensure that those who do are held accountable.